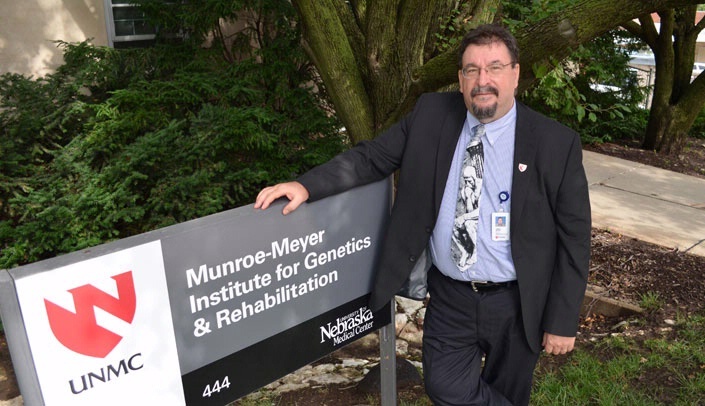 Karoly Mirnics, M.D., Ph.D., started Friday as the new director of the Munroe-Meyer Institute. Dr. Mirnics, who came from Vanderbuilt University, said he sees great potential for growth at MMI, especially with the many strengths the institute already enjoys. "The community support is great," Dr. Mirnics said. "Not only the donor base, but the base in the community. Success is not only about raising money -- it's about other people, outside of MMI, who are willing to integrate and pool strengths together to accomplish something." Dr. Mirnics already is developing a list of every intellectual and developmental disability (IDD) stakeholder in the state, and he hopes to meet with them to ask "What are you most proud of? How can we help? How can we do it together?" the Intellectual and Developmental Disabilities Research Center (IDDRC). Two, the UCEDD and the LEND programs, are already in place at MMI. "The only one missing is the IDDRC, and if we could get it, it would put us in the top five institutions in the country for intellectual and developmental disabilities," Dr. Mirnics said. "There are only four or five institutes that have all three components right now, across the whole country. So that's something that should be one of our focuses down the road." The diversity of programs and services at MMI is a strength, but it also presents challenges, he said. "With every institution that is big and diverse, the challenge is to integrate the different entities," he said. "Munroe-Meyer also has people spread across different buildings. In every institution I've worked at, that's always a challenge -- if people are physically separated, there is not that much contact between them and they don't integrate as well or talk to each other as much as they should. That's something I want to improve on." He also wants to maximize MMI's impact in the state. "Right now my feeling is that MMI is a major player in the IDD community. I don't want it to be a major player -- I want it to be the major player, the integrative force across the state. If you want to develop a new policy about IDDs, you will pick up the phone and say, 'There is no dilemma -- I'm going to contact MMI.' "
Fill out the following and your comment will post once it has been approved. Thank you, your comment will appear below once it has been approved. Welcome, Dr. Mirnics. We look forward to working with you! Dr. Mirnics was formerly the James G. Blakemore Professor of Psychiatry and vice chair for research, department of psychiatry, at Vanderbilit University. He was associate director of Vanderbilt Kennedy Center for Research on Human Development, and senior fellow of Innovative Systems Biology and Systems Engineering (VIBRE) at Vanderbilt. He earned his M.D. from the University of Novi Sad, Yugoslavia. His Ph.D in neuroscience was earned at Semmelweis University in Budapest, Hungary. He has a broad background in molecular neurobiology of brain diseases, with more than 20 years of experience in various molecular biology techniques. To read his full CV, which also includes Dr. Mirnics' academic appointments, hospital appointments, professional memberships and activities, publications, presentations and other information, click here.